The mainstream media may have formed a defensive barrier around Google in response to the President, but there are many examples of Google expressing its political bias in ways both big and small. Breitbart Tech has collected ten popular examples of Google’s left-wing bias in action. Former Google engineer was fired for expressing mild criticism of Google’s far-left diversity policies and political monoculture. His arguments wouldn’t have been out of place in a David Brooks column or a Jonathan Haidt lecture. Despite the mildness of his arguments — which were more liberal centrist than conservative — radical leftists at the company succeeded in getting him fired, after maliciously leaking his viewpoint diversity manifesto to the press. Damore, along with other current and former Google employees, is now fighting a class-action lawsuit against the company alleging that it discriminates against people of a non-progressive political viewpoint, and against white and Asian males. Google’s workforce is riddled with supporters of Antifa, a far-left group categorized as a terrorist network by U.S. security agencies. Members of this bloodthirsty movement have pleaded guilty to plotting acid attacks at pro-Trump events. On the west coast, an Antifa member was arrested for smashing a Trump supporter in the head with a bike lock. Yet when Breitbart News reached out to Google asking them to provide a general disavowal of political violence, the company declined to do so. When WikiLeaks published a trove of Clinton campaign manager John Podesta’s emails during the 2016 election campaign, one of the revelations was that Eric Schmidt wanted, in Podesta’s words, to be “head outside adviser” to the Clinton campaign. According to Podesta’s email, he expressed this wish as early as 2014. Schmidt wasn’t joking. Ahead of the 2016 campaign, he set up a shadowy grassroots organization called “The Groundwork.” Little is known about its operations and composition, but its stated aim was to harness the expertise of Silicon Valley to put Hillary Clinton in the White House. 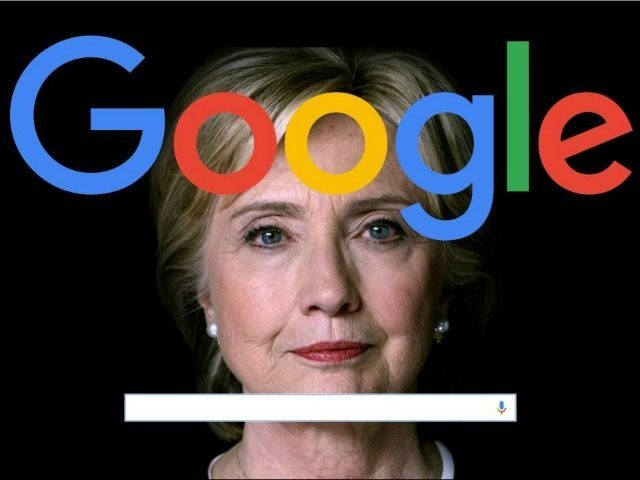 A video from tech news site SourceFed in 2016 reported that negative search terms for Hillary Clinton did not autocomplete, despite the fact that those terms (like “Hillary Clinton criminal”) were popular, and autocompleted just fine on Bing and Yahoo. Moreover, negative search terms for Clinton opponents Bernie Sanders and Donald Trump did autocomplete. Google’s explained that they don’t allow negative autocompletes about individuals, period. But they failed to explain why Sanders and Trump were apparently exempt from this rule. Later in the year, research conducted by psychologist Dr. Robert Epstein found that Google’s search results as well as its autocomplete suggestions were biased, and could have shifted up to 3 million votes towards Clinton. Not enough for her to win, clearly. But will that be the case with the Democratic candidate in 2020? Yes, this actually happened. A Google insider gave Breitbart News this bit of information (and some other internal horror stories) back in 2017. That wasn’t the only thing revealed by disgruntled Google employees. The firing of James Damore led to an outpouring of leaks from the company, which were published exclusively by Brietbart News. The horror stories included senior management prioritizing diversity over good technology, efforts to demote politically incorrect content in search, and employees getting demonized, excluded, and even punched for being too conservative. When you conduct a Google search, chances are you’ll see a Wikipedia link at the top of your results, or information from Wikipedia in the “knowledge panel” that appears on the right-hand side of some Google searches. The online encyclopedia is heavily favored in Google search results. The online encyclopedia is also infamous for its unreliability and far-left bias. Editors on the site added ICE detention centers to a Wikipedia article on “concentration camps.” They added Donald Trump and Tucker Carlson to a list of “neo-Nazi conspiracy theorists.” They even created an article dedicated solely to criticism of the President’s handshake style, and featured it on Wikipedia’s front page. This is the “encyclopedia” that Google relies on for many of its top search results. This is an initiative of Google News spread across the company’s services and sister companies,including YouTube. Typically of recent big tech power-grabs, the initiative was presented to the public as an effort to combat “misinformation” online. Google will do this by funding misinformation at news organizations like far-left Vox, a website that claims the Clinton email scandal is fake news. Google regularly invites academics to its headquarters to give lectures and allows employees to offer suggestions for invites. Well, some employees. If you suggest a world-renowned academic who is nonetheless loathed by the left and media establishment, like Jordan Peterson, your suggestion will be denied. But you invite a racist to give a talk on “white fragility,” that’s perfectly fine!